We are proud to have purchased our foundation ewes from Joe and Leigh Esler, ‘Damfattail’, who are located at Table Top, near Albury, NSW. 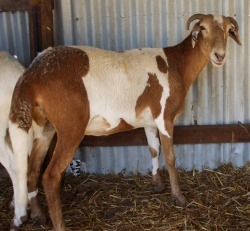 These females are a mix of F4s and purebreds, from well known Western Australian genetics. Our ewes have finished lambing in May with some spectacular lambs now frolicking around in the green grass. 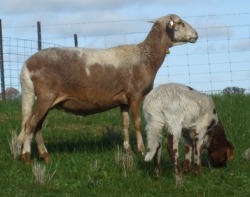 Cassie is our leading Damara lady; she shows her age a little but still produces fantastic lambs. Her ewe lamb is simply stunning this year. This girl is long bodied and full of breed character, with fantastic unique colouring as an added bonus! Roo is a plain bodied ewe who throws lambs that are far more impressive than her. 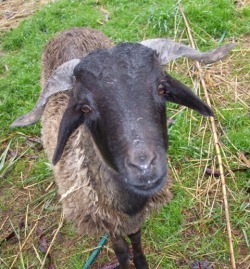 She is a deep bodied, thick set ewe, we just wish she was a little longer bodied with slightly more breed character. She is an excellent mother and is raising a very fat, well grown ram lamb. Roo is our only ewe with WADDLES! This girl is a favourite of mine because of her easy going nature and friendly temperament. She is always the first at the fence to talk to me. She will follow me round like a puppy dog. 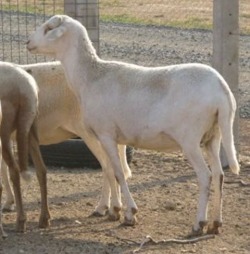 She is also a very good bodied ewe, tall, rangy and long bodied. She does lack a little breed character in that her tail is shorter than ideal. However, her lambs all carry a full tail. 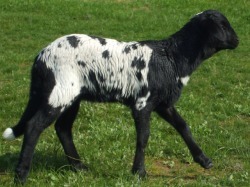 She has the hooded colour pattern in light orange, and gives the hooding to her lambs ranging from light brown to black. Chancey is a very exciting ewe - she just oozes with breed character, she is tall and rangy, with a long body and a beautiful head. Structurally she is very sound and she is the type of ewe who really stands out in the crowd; she has that 'look at me' factor. And her colour is fantastic! We cannot wait to see the lambs she produces for us. Minty is a very special sheep. She was bottle raised after being rejected by her mother, so she is extremely friendly and people orientated. 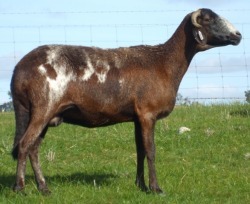 We obtained Minty to include in our herd as a breeding ewe as well as a show and publicity ewe. However, we have since learned that Minty is a hermaphrodite and as such is unable to breed. We have kept her for a short while as a babysitter for poddy lambs and weaners, and a teaser/spotter for AI; however she has now been rehomed and is a pet and lawnmower. What a stunning ewe lamb! This little lady has been a head-turner and eye-catcher since the day she was born. Between her striking colour pattern and her conformation, she has the potential to grow into a very high quality female. She is certainly living up to her dam's reputation as a high class animal.